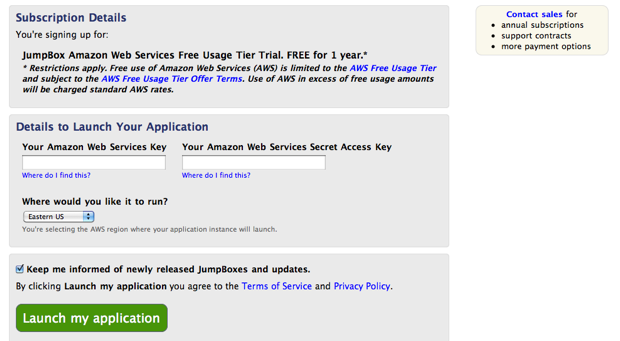 Last October Amazon launched a feature that’s exciting for developers: a free usage tier that provides a limited amount of access to EC2, S3, and Amazon’s other cloud products free of charge. It’s a big deal because it lets developers roll out new projects without any upfront cost (they only have to start paying when their project takes off). But it hasn’t been particularly useful for average consumers, who don’t know how to set up projects on Amazon’s Cloud. Now JumpBox, a startup that offers ‘Open Source as a Service’, has launched a feature that makes this free usage tier accessible to just about anyone. The feature supports one-click installs for WordPress, Drupal, MediaWiki, and Joomla — you enter your Amazon secret key, create some JumpBox credentials, and you’re off and running. JumpBox benefits from getting exposed to new customers (who may also opt to install other apps at a premium) and Amazon benefits because these users may eventually hit the limits on the free usage tier and switch to paid plans. 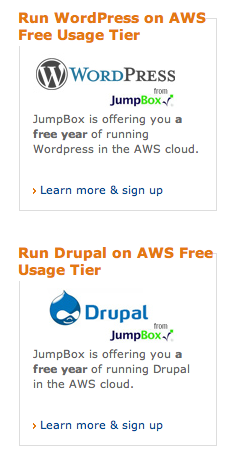 The good news for JumpBox is that this feature is now being promoted on the AWS free usage tier homepage (you can see the promotion widgets at right). However, I’d expect many of the people arriving at that site know how to install WordPress or Drupal on their own servers already. Also note that this isn’t the only service to provide one-click installs on cloud platforms — we’ve previously written about Standing Cloud that offers some similar functionality.